Reactive Hypoglycemia or Afternoon Slump? Is Low Blood Sugar Causing Your Afternoon Fatigue? If you feel great outside the workplace, but your energy fades as the day wears on when you're at work, you may just be having a common workplace effect known as afternoon slump. It comes from being inside an office building without natural ventilation and natural light, resulting in a general feeling of malaise or fatigue. 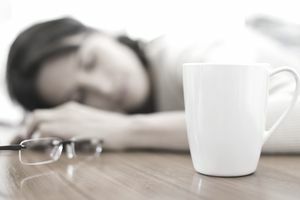 Dr. Sally Norton describes afternoon slump as "a wave of tiredness, a loss of concentration and the seemingly impossible battle to keep your eyes open." Afternoon slump affects most people mid-late afternoon, usually around three. Simple changes in your routine and diet may be enough to end afternoon slump for good. Severe afternoon slump shouldn't be dismissed as an ordinary and expected part of your workday. Extreme fatigue, especially when the symptoms of shakiness, dizziness, or sweating are present, could be a warning sign of reactive hypoglycemia. Severe slump symptoms include a profound and intense desire to sleep, muscle fatigue, sweating, the shakes, headaches, changes in vision, or any combination of these symptoms. These symptoms are not signs of "normal" sluggishness that can occur in mid-morning or the afternoon. If these symptoms become severe enough that they decrease your ability to complete tasks, you may want to seek advice from a physician to rule out certain health problems. Reactive hypoglycemia can also start to occur in patients after gastric bypass surgery and is more common in young children than in adults. It's normal to occasionally feel sluggish in the afternoon, especially if you're under a lot of stress, not eating properly, or getting enough sleep. But if you have any of the above symptoms, you may want to talk with your doctor about finding ways to rule out reactive hypoglycemia and to treat your symptoms, so you can get through the afternoon without feeling the need to crawl under your desk for a quick nap. Disclaimer: This information is not intended to diagnose or treat any medical condition and should not be used as a substitute for medical advice from a licensed health professional. If you suspect you may have problems with low blood sugar, call your doctor immediately.